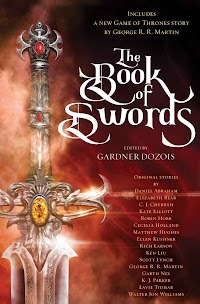 "The Sword Tyraste," by Cecelia Holland [bio] (edited by Gardner Dozois), appeared in The Book of Swords (RSR review), published on October 10, 2017 by Bantam Books. Pro: This is a tale told in the form of a Viking legend. Vagn gets his revenge and more, although he finds the Vedrborg ultimately unsatisfying. It’s creditable that Vagn isn’t a great swordsman. In none of his three fights does he succeed because of his skill. That makes sense given how green he is. Vedrborg probably means “castle of storms” in old Norse. Con: This is much more a tale than a story. Little of what happens is really about Vagn reaching his goal; it’s just things that happened to happen at the castle. Even the final fight is trigged by Vagn’s emotional reaction—not by any real planning on his part. There are a few elementary writing errors in this piece that are annoying. Places where POV wanders in a single scene or where an emotion is narrated. Not enough to ruin the work, but disappointing nevertheless. If Galdor sealed up the room with the corpses in it, why was Vagn able to walk in and find the blacksmith’s head?